As you read this Jump Manual review, try to find the key factors that you need to remember so you can easily point out what you need to do as you are in your training. 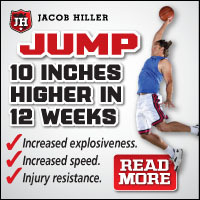 This will inform you of the numerous lessons and principles that an average jumper needs to know, learn and apply to be an extraordinary jumper. According to the author, the Jump Manual have shown or created some formulas so we can easily remember the principles that he wants to teach us. Here are some samples of the formulas and principles that should be remembered. When you are training, you need to train your explosion and not endurance. The equation, strength x quickness = explosion, is the basis of your training. You need to keep your workouts in the “improvement zone.” If it doesn’t reach that zone then do not train at all. Plyometrics are to be done minimizing the “amortization phase” and with each explosion it should have a maximum strength and speed. There should be NO extra bounce or movements. LAP, which means for perfect plyometrics, Load- Amortization-Explode, treat each repetition with focus and intensity of the single event, recruiting all fibers, and firing all fibers at maximum rate, is the only way to extract the maximum benefit from a weight training regime. Lastly, train with 85% of your repetition max, and you need to do each repetition at maximum speed. In case the speed is jeopardized, the repetition should also be lowered. If you try to analyze it, these formulas are simply the summary of each chapter of the said manual. They are the main ideas of the whole lesson. These are the only factors that you should remember as you enhance your jumping skills. If you memorize this, then it will be easier for you to adopt the training. Once you have already adjusted your pace, try to do that as often as you can and you will see the result of your effort in no time. Try to play an actual game that requires jumping, like basketball, for you to see if you have really improved in jumping or not. If you have not tried dunking before then now is the time to try it out. If you were able to dunk, then that means that your ability to jump has improved. Also, you have to try to glide, float, fly and defy gravity. These techniques require more time in the air. The higher the jump, the more time you have to float in the air like Michael Jordan. That is why they call it air time. You can find and read the summary of all this information in a Jump Manual review such as this. The author has simply written his experiences and how he turned from an average jumper to a great jumper. That’s why principles found in this manual are, without a doubt, real. They came from a firsthand experience and it was proven as well. This is a proof that anyone can be a great jumper as long as they follow exactly what is written and suggested in the manual. If you want to prove to yourself that what you read from this Jump Manual review is true, go ahead and try it and see for yourself.